SMART FINISH is excited to have taken delivery of our NEW SRI PRO series DeVILBISS HVLP spray gun. This is a highly engineered gun, made specifically for the SMART repair industry. It’s precision and finesse will undoubtedly prove to meet the highest quality in auto refinishing. We all like getting new toys to play with in our various industry’s, and for us this is our new toy! 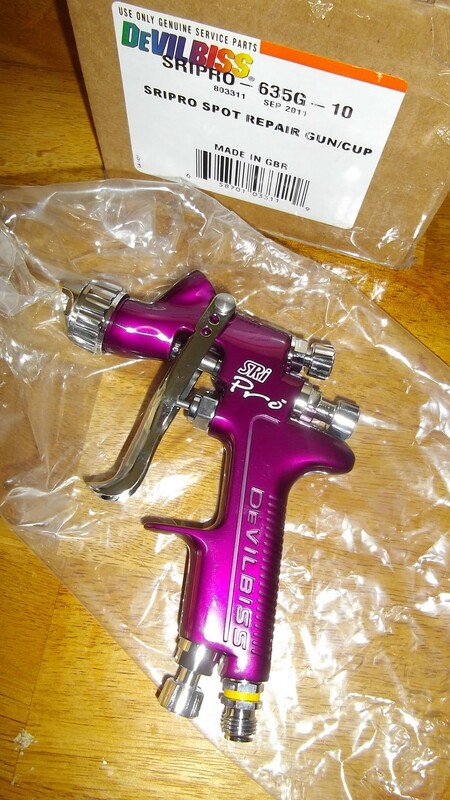 The Ferrari of HVLP spray guns. Without boring one with all the details of the SRI PRO series gun, it basically means as a repairer, we can provide the highest quality given to you “the customer” with absolute satisfaction in the end result. If we’re happy, you’re happy! This is the 1st if our DeVilbiss guns and we aim to upgrade all our finishing guns to this reputable and high quality brand. A little info about HVLP. This is similar to a conventional spray gun using a compressor to supply the air, but the spray gun itself requires a lower pressure (LP). A higher volume (HV) of air is used to aerosolise and propel the paint at lower air pressure. The result is a higher proportion of paint reaching the target surface with reduced over spray, materials consumption, and air pollution. A regulator is often required so that the air pressure from a conventional compressor can be lowered for the HVLP spray gun.